Last year, in 2017, a hitherto unacknowledged US Department of Defence (DOD) UFO study program, as if we need reminding, was publicly revealed. The name of this effort has been quoted as the “Advanced Aerospace Threat Identification Program” (AATIP). Sometimes the word “Aviation”, rather than “Aerospace”, has been used in the title, but whatever the exact terminology, the DoD themselves have confirmed, at least, that it did exist. The massive Defence Intelligence Agency (DIA) was where it was housed, and the accepted timespan of the endeavour was 2007 to 2012. Official UFO analysis work continues today, and was apparently migrated to a new interagency partnership, but that story will have to wait. The AATIP effort was headed by DOD staffer, Luis Elizondo, who specialises in the intelligence, counter–intelligence and security arena. So much has now been authored and debated about this whole affair, that it would be pointless to rehash the same information yet again. On the 30th of March, 2018, the DIA’s Chief of FOIA and Declassification Services Office, Alesia Y. Williams, replied to my request, which was sent to me in the mail. My request had been received by the DIA on the 28th of March, 2018, and given the FOIA processing reference “FOIA-0222-2018”. It acknowledged that my submission was at the back of the queue, which Williams stated was “in excess of 1,139 requests”. Also, in the reply letter, the exact wording of my FOI request, which FOI officers usually quote back to you, had been changed slightly. Things had been moved around. I’m not sure what to make of this, Maybe they like to clean up the wording of FOI requests to make record searching easier for the poor soul who gets landed with the job. I’m not sure. Furthermore, my request was not going to be processed within the normal 20-day time period. Williams quoted “unusual circumstances” such as the need to search for and collect records from multiple facilities, the likely volume of records, and the need for consultation with other interested agencies. We’ve seen this same wording time and again. Its normal now. I can say it in my sleep. I have imaged Alesia Y. ’Williams response below. Talking further with my defence contact, he stated that I better try the Office of the Secretary of Defence and Joint Staff (OSD/JS). Specially, he stated that the Office of the Under Secretary for Acquisition, Technology and Logistics (USD AT&L) or the Office of the Under Secretary for Intelligence (USD I) would likely have at least some records related to the AATIP, or, as I was now focusing on, the AAWSAP effort. As those entities are located within the OSD/JS, I submitted an FOI request to the OSD/JS FOIA portal on April the 6th, 2018. 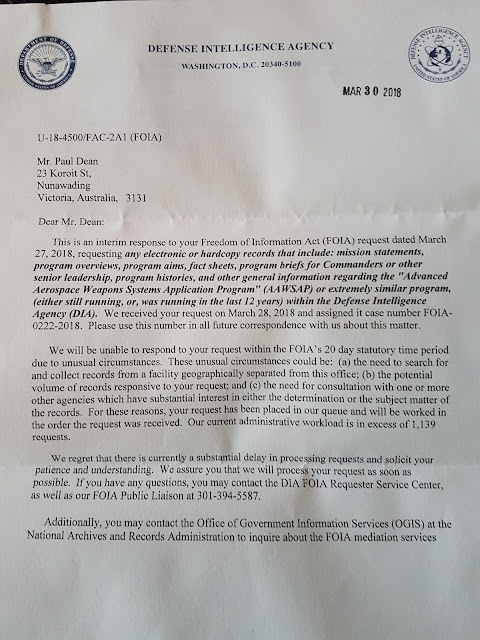 The Chief of the OSD/JS FOIA office, Stephanie L. Carr, who I have had significant correspondence with before, prepared her reply on the 12th of April, 2018. My request was given the reference number “18-F-0785”. Her reply contained the same processing wait times, issues with searching and collecting records, etc as they always do. In fact, the OSD/JS FOI workload was at a massive 2,283 requests, and it isn’t going south down anytime soon. Of course, all this is based on what a DoD contact told me. The term “Advanced Aerospace Weapons Systems Application Program”, or its “AAWSAP” abbreviation, hasn’t been mentioned by anyone else. Not the New York Times, not Luis Elizondo, and not even the DIA’s public relations staffers who must, by now, have been flooded with enquiries. Wanting more confirmation, I decided, on the 15th of April, 2018, to ask someone attached to this whole thing if they would confirm a rather bold claim I had. Taking a risk, I brashly stated that “I now know AATIP wasn’t the real name of the UFO program…”. The person who was at the receiving end of this paused and replied “I know, I know.. What have you gone and done now?”. I answered, “Give me one word, just one term, from the real title, and I’ll tell you what I think it is..”. He mulled over the issue and then stated “Weapon!”. I replied, “Yep, how’s Advanced Aerospace Weapons Systems Application Program sound?”. He replied, “Well, good luck, good luck, you have it.”. Clearly, there was something to this. Part of this potential paper trail is the issue of a number of audio-visual releases which purport to show UFO’s. Somewhere in amongst the “To The Stars Academy” (TTSA), the The New York Times, and the US military itself, it has been made possible to have this media disclosed openly. Again, only the barest discussion is needed here. We all know the story. The so-called “Nimitz” or “Tic Tac” UFO footage, and the “Gimbal” UFO event, as well as the newer “Go Fast” incident, were all imaged by F/A–18 Super Hornets off the coastline of the USA. That much is accepted. But the manner of how these audio-visual records were declassified, processed, released, whatever has been open to some debate. I had assumed that the FOI had been invoked to see that the DoD, and maybe specifically the US Navy, release the various pieces of footage. However, when I contacted the Assistant to the Secretary of Defence for Public Affairs (ATSD/PA), some time ago, they couldn’t shed any light on the matter. On the 25th of February, 2018, Elizondo spoke on radio podcast “Coast to Coast”. There, he revealed that he used the services of the Defense Office of Prepublication and Security Review (DOPSR). In conjunction with that effort, Elizondo said he utilised a pair of DOD publications which govern the clearance and release of certain information to the public. Moreover, Elizondo stated that the document he used was a “DD Form 1910”. I had previously written about all this in Part 1 of what should be a two or three part blog series. Quoting heavily from my work there, DOPSR is an office which is located within the Office of the Secretary of Defence (OSD) and is “responsible for managing the Department of Defense security review program, reviewing written materials both for public and controlled release”. 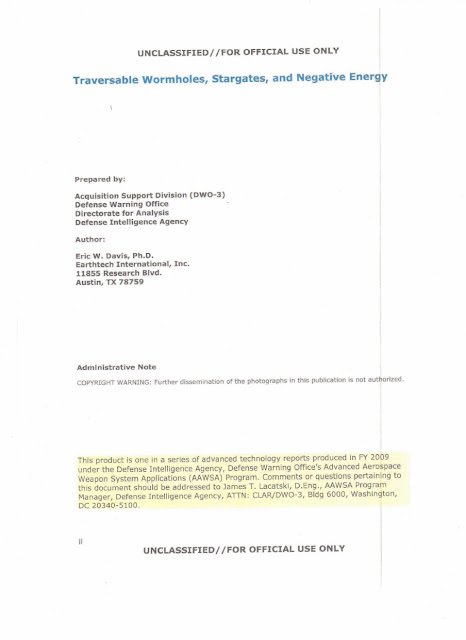 The two publications ostensibly the center of Elizondo’s video release efforts are “DOD Directive 5230.09, Clearance of DoD Information for Public Release”, which was certified as current on the 22nd of August, 2015, and “DOD Instruction 5230.29, Security and Policy Review of DoD Information for Public Release”, which was promulgated on August the 6th, 1999. As stated, Elizondo said he used a DOPSR–issued “DD Form 1910”. Its title is “Clearance Request for Public Release of Department of Defense Information”. Completed forms are submitted to the Chief of DOPSR, and a copy is sent for coordination with to the DOD’s Director for Freedom of Information and Security Review (DFOISR). Copies of whatever material, be it documents or audio–visual material, that the applicant wants released are submitted with the “DD Form 1910”. On the 1st of March, 2018, I submitted an FOI request to the Office of the Secretary of Defence and Joint Staff (OSD/JS) for a copy of whatever they had in the form of DOPSR “DD Form 1910”. Again, like most FOI requests, slowness defines the progress. Swedish researcher Roger Glassel has done something that I didn’t, and, to my knowledge, no one else has either. He has found a two official references, and I mean actual documents, to this new “Advanced Aerospace Weapons Systems Application Program” caper. Glassel isn’t overly interested in obtaining all manner of AATIP, or AAWSAP, or whatever, records. He is focused on finding out what sort of formal DoD “chain of custody” documents were involved in the release of the audio-visual material that shows unknown objects being chased by the US Navy’s best combat aircraft. As mentioned, Luis Elizondo, who headed the AATIP desk, stated he used DOPSR “DD Form 1910” documents. But Glassel’s research has met with denials and dead ends. Writing on Curt Collin’s blogsite “Blurry Blue Lines”, Glassel has detailed the steps he has taken to find out if indeed DOPRS was involved, and if not, how were the videos released. Put simply, the DOD have basically denied that they released anything. Quoting from Glassel’s detective work would be to lengthy here, but it should be reviewed to understand what has been going on. Its all here. There it is. A reference to an “Advanced Aerospace Weapon System Application (AAWSA) Program…” is right there in black-and-white, and I've imaged Page 2 of one of the publications, namely “Traversable Wormholes, Stargates and Negative Energy”, that Glassel discussed. The colored box at the bottom contains the Advanced Aerospace Weapon System Application (AAWSA) Program term. Further, the Program Manager listed here is one James. T. Lacatski. Keith Basterfield, an Australian researcher I regularly work with, has done some research on this individual, and it has been published here. Now, the exact term is slightly different to what I was told. The terms “Weapons” and “Systems” are, as per the Dr. Eric Davis DIA Defence Warning Office (DWO) papers, actually “Weapon” and “System”. That’s not unexpected I guess. The usage of the word “Program” within the full title may not be officially correct either. It’s a case of “AAWSAP” versas “AAWSA”. Whatever the situation, its abundantly clear that this is all the same thing, and it relates very heavily to the original AATIP effort. Furthermore, Glassel, who had much earlier submitted an FOI request to the OSD/JS over all this, has been able to modify, or re-scope, the wording of his submission to take into account his clever AAWSAP, or AAWSA, discovery. For ease, I’ll use what I was originally told, even if it may not be exactly the name. The bottom line is that this sudden producing of old DIA documents with the Advanced Aerospace Weapons Systems Application Program reference in plain view has now meant I am freer to discuss it. I had been told to keep it to myself, and to submit my FOI requests as I wished. Under no circumstances was I to fling all the details around. The main person helping me has a clean security record. He doesn’t need any drama, even if it is just over this increasingly well-known UFO program issue. With Glassel’s work in mind, I spoke today to my defence contact again, and, as we are making headway, he told me a bit more. What I gather is that the AATIP desk was a major part of the overall AAWSAP effort. Also, the term AATIP was developed over time, and may have been tacked on to, or into, AAWSAP. AATIP was a looser title for internal usage, and it continued in other channels while the overall AAWSAP appears to have ended. Then I asked him about the release of the UFO videos. Despite what the DoD is stating, he insists that Elizondo used a DOPSR “DD Form 1910”. I challenged this by asking why the DoD Public Affairs desks are saying otherwise. He stated that “corners were cut” and that “PA people’s noses are out of joint”. Public Affairs approvals didn’t happen after DOPSR were involved, and they should have. All this makes things rather difficult. If so many FOI requests have stipulated that AATIP is the target, and no one has mentioned, except me and Roger, the AAWSAP angle, its going to be a slow year. First what is AATIP? Advanced AVIATION Threat Identification Program, or Advanced Aerospace Threat Identification Program both names have been used by former employees. Okay, the Jerkwads at DOD are professional FOIA officers. The office there is not manned by a 2nd Lieutenant as an extra duty. A number of FOIA requests have come back "no record." Probably true and in accordance with regulations and if answered that way goes into the statistics as the number of properly answered FOIA requests. 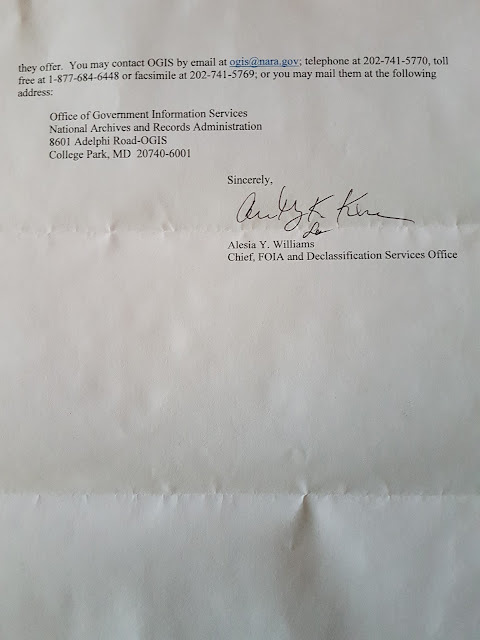 A few years I sent a FOIA in to the Army, my answer was: "This request was directed to the incorrect office due to reorganization and changes in office symbols. We have forwarded your request to the proper office." Such professionalism apparently doesn't exist in DOD. After the news appeared in the New York Times, they should have expected to be flooded with FOIA requests on the subject. Extremely impressed by your work, Paul. Same with Roger and his efforts. I think a reward is in order. How about a AAWSAP t-shirt? Just acknowledging my admiration for what you are doing. Thank you Paul.